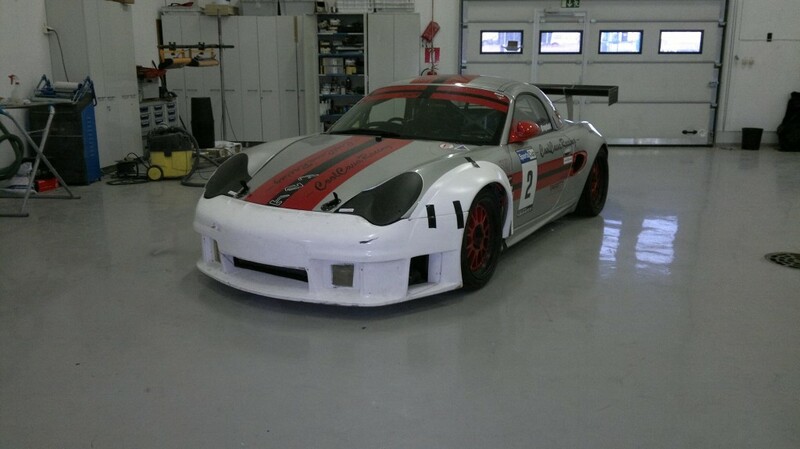 Our good friends over at LT-Studio have been hard at work trying to get the CoolCava Racing Porsche Boxster driven by team member Pål Krogdahl ready in good time for the start of the 2014 Porsche SportsCup here in Finland. 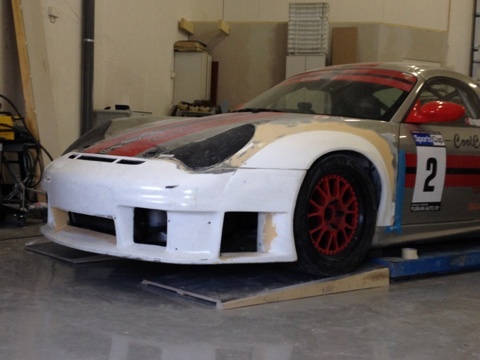 As you can see the front end of the car has now started to be painted and is close to ready. Primer has been put on and next is the colour that LT-Studio have selected. Pål made an agreement with LT-Studio that they could own the livery design for the 2014 season and with that they decided that all parts that they have worked on will be distinguishable from the other parts on the car – but what colour will they decide to use? We took a trip up to Sipoo to say hello to our good friends at LT-Studio. Whilst there are many things we can do here at CoolCava Racing Motorsports Engineering, when it comes to the fine art related to complex bodywork and paint we hand all our projects and work over to LT-Studio who are both a working partner to CCR Motorsports Engineering and a sponsor to Team CoolCava Racing driver Pål Krogdahl. This trip was all about Porsche RSR. We collected the white Porsche 911 RSR race car which had been with them for some cleaning work and a paint job ready to be put up for sale. 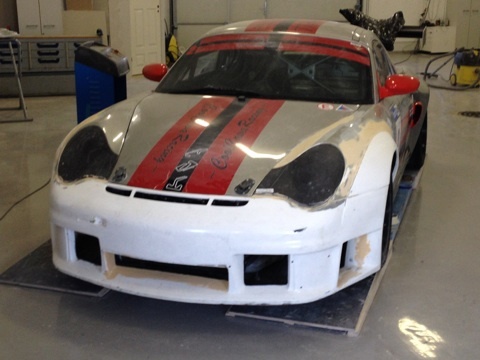 This road legal racing car has an interesting history starting life as a Porsche 912 before getting this nice 911 RSR slant-nose body conversion. The car was converted to RSR look quite some time back when it was built as a road car for the then owner of Bella Boats here in Finland. At the time Bella were one of the main sponsors for Matti Alamäki, one of the leading rallycross drivers in Finland. This car was built as a copy of the car that Matti drove at the time. 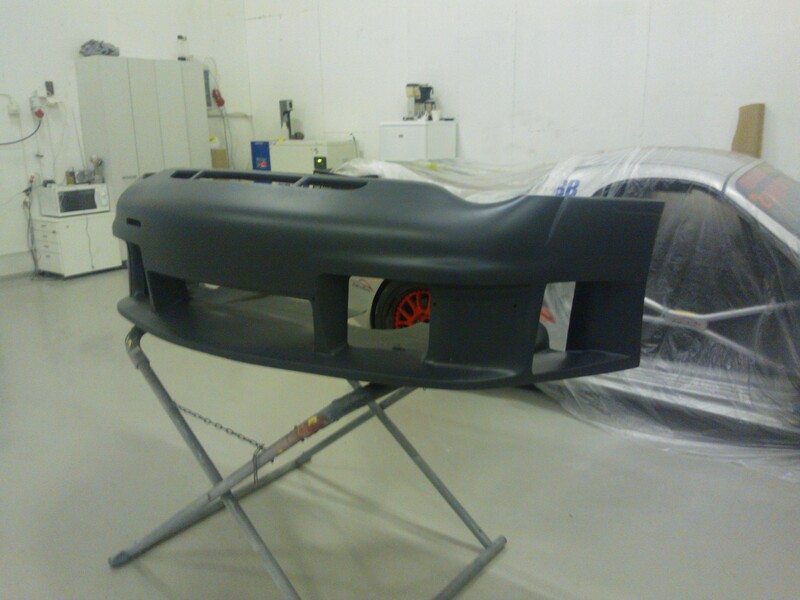 The front fenders, front bumper and rear bumper are fibreglass. The rear fender extensions and side skirts are steel. The car was converted into a racing car several years later after it was sold by Bella Boats. We did not travel up to LT-Studio with an empty trailer. We had with us the lovely Porsche Boxster S which is raced successfully by Pål Krogdahl in the Porsche SportsCup. This car which was originally built to Pål’s specifications by SVP in England, another of our close working partners. After delivery to Finland we here at CCR Motorsports Engineering have been maintaining the car with close collaboration with SVP. With LT-Studios, we decided to make some slight alterations to the car again before the start of the 2014 season, and as there is no where better in Finland for this project we decided to drop the Boxstre up to them – and they wasted no time in getting stuck in. 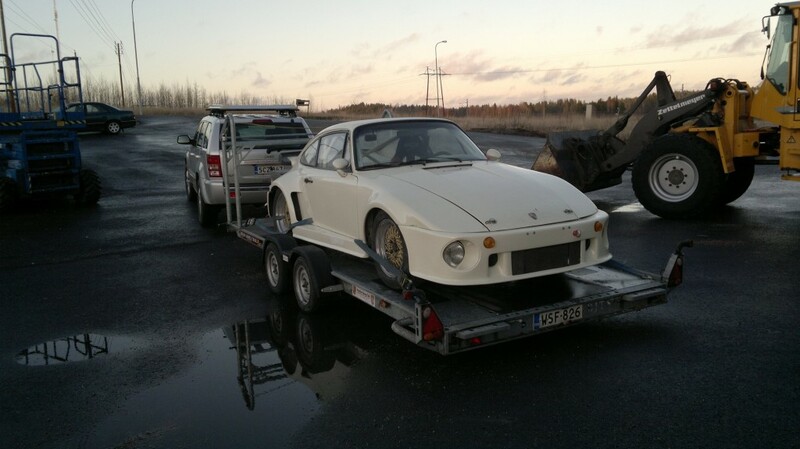 Parts were already taped on and discussions on how to best attack the project were going on before we had even managed to get the Porsche 911 RSR onto the trailer for the trip back to Espoo! Along with this body make-over which will further improve on the cars aerodynamics and remove the cooling issues we had during the 2013 season, we are also discussion engine and suspension improvements with our friends at SVP, who will be with us here in Finland for final test and set-up before the first race in the 2014 season. Stay tuned for future updates on this project, and do not forget to visit us on Facebook and like our page.